With the booming job market, employees have been increasingly hopping from job to job, searching for organizations that truly appreciate them. In fact, 3.6% of workers leave their job each month. It is imperative that employers value their employees as an important asset, in order to avoid high turnover rates. 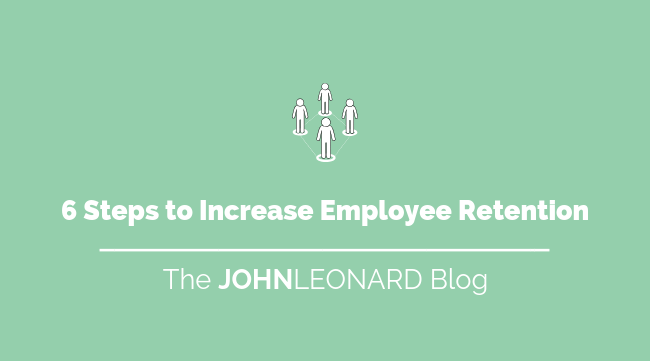 To ensure your organization doesn’t lose millions of dollars each year, keep reading to learn six steps on how to increase employee retention and maintain your top talent. The highest employee turnover rates occur within the first 18 months of employment. According to the Society for Human Resource Management, employee turnover can be as great as 50% during this time. This can put a financial strain on the organization as well as fall behind on work. 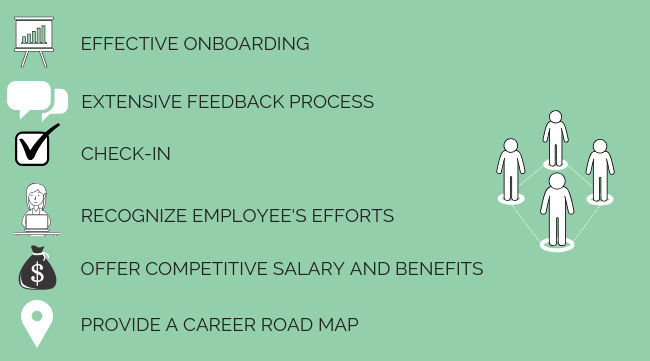 To avoid high turnover rate, employers should conduct an effective onboarding process. Provide training that includes information about the company and culture and also ease the employee into their job responsibilities and tasks. With a majority of employees reporting a desire for more training, it is important that companies invest a high volume of time into employee’s first weeks. Offering employees the ability to provide feedback is key to making adjustments and changes to strengthen your employee’s commitment and dedication. In addition to annual reviews, encourage them to share continuous feedback so that adjustments can be made on the spot and any grievances can be addressed immediately. Offer the option to allow employees to communicate anonymously to the entire company to ease tensions with team members and managers by making sure that everyone’s voice is heard equally. Often times, employees are in the better position to see what can be improved within a company and make suggestions to management. Regular check-ins with your employees will foster a healthy relationship and allow them to openly discuss concerns they are having about their position or the organization. Retention will be drastically increased by being transparent and open about the company’s strengths and weaknesses and how they can contribute to the company’s success. We’ve said it before and we’ll say it again, recognize your employees for their contributions and success. By making them feel valued, they will be more likely to form a strong connection with their managers and organization as a whole. Global studies revealed, that 79% of people who quit their jobs listed “lack of appreciation” as their reason for leaving. More often than not, it is resentment towards managers that cause employees to look for new opportunities. Salary and benefits play a large role in employee happiness and perception of a company, especially with today’s generation. While benefits can’t buy an employee’s loyalty, they can certainly help. Top talent comes with a price and often times, it is well worth the investment. Consider offering your employees stock options to form a greater loyalty to the successes of your company or a more flexible work schedule to show your appreciation and value of your employees. This can ensure employees are fully engaged while at work and eliminate distractive and resentful behavior. By helping employees with their career development and adjusting roles to their strengths and skills, employees will be less likely to look for other opportunities. Career advancement is important to 83% of employees, but only 20% feel very satisfied with career growth and planning within their company. Address career growth within your organization, provide employees with a career road map and offer internal promotions when available. Employees will feel invested in while at the same time, you will be saving your company the added cost of an external hire. While employee turnover cannot be completely eliminated, these strategies will help your company improve and increase employee retention and engagement so they are less likely to seek out other (better) opportunities. Looking to stay up-to-date on the current hiring trends? Subscribe to the JOHNLEONARD blog and we'll keep you informed of the updates you need to know!